The Ninja: Sensei is an average quality article, but could be even better! The Ninja-Sensei is a video game developed by Snowtendo which is based on Sensei and other penguin and puffles, like Link and Mabel. It plays on the console of [[Snowtendo Vii] and Snowtendo DS. You start life as a penguin on Club Penguin. You and your friends were scaring each other during the Halloween Party of '08 at the cove when they saw lightning strikes at the Dojo and Ternville hovering above. They went to the Dojo to investigate and saw a huge hole in the roof. G and Rory were already there along with a crowd of penguins. When the construction crew moved in, citizens began digging out the snow. When all the snow was dug out and moved to THE SKIP, a new Dojo was dug out. Sensei, a ninja teacher let penguins play Card-Jitsu. In stage one you have to beat your friends (which is easy, even on hard mode). After doing that you unlock Class 1 shops (cheap shops)and Dojo-credits (the higher level the penguin you beat, the more D-Cs). Stage 2 begins after you finish Objective Book One (see bottom of page) which allows you to battle other penguins and puffles. When stage 2 is finished, you unlock Class 2 shops (50-50 shops). Stage 3 begins after finishing Objective Book Two (like last time). In stage 3, you can battle more penguins (like Link and the [[X-virus|X-antibodies). After finishing Objective Book Three and mastering the Ninja, Stage 4 starts. Sensei then gives you allies to help defeat the bad guys. 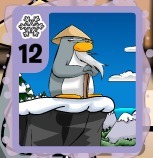 Along with that he creates a group of penguins known as The Antarctic Card-Jitsu Defence Council (known as TAC-JDC or Allies) and you unlock Class 3 shops (Ninja shop). After finishing all objectives you fight bosses and have a Two on One mode where you get to chose one ally and fight along side you (rather than using an ally once a round). Stage 4 and Class 4 shops (Villan Items Shop)also get unlocked. In Stage 5 you don't unlock a shop. Instead you have to battle Darktan! It is also an Allies on One match (even so, it's hard). After defeating him, the USA congratulates you. This is then followed by the credits. When Link was captured, a Special Edition came out. It has a download feature, mini-games and much more! SE-EI (Special Editon-Extra Inclucions), the newest version, has map mode (with real life locations), Make-A-Card mode, Replay modes and more. Two sequals has been released, both on the same day, The Ninja: Star Force and The Ninja: Commando. You can buy them at the same time via The Ninja: Star Commando which includes extra maps, new missions and a special "pre made" and "saved" ninja feature which enables you to choose ninjas made by the company or make your own ninjas and save them for later use. In 2010, a Collectors Edition was released to commemorate the release of the two sequels. It contained a disc with special features and the game disc which had the normal and special editions (both) combined into one. It cost 1100 pebbles. This page was last modified on 31 May 2017, at 16:57.